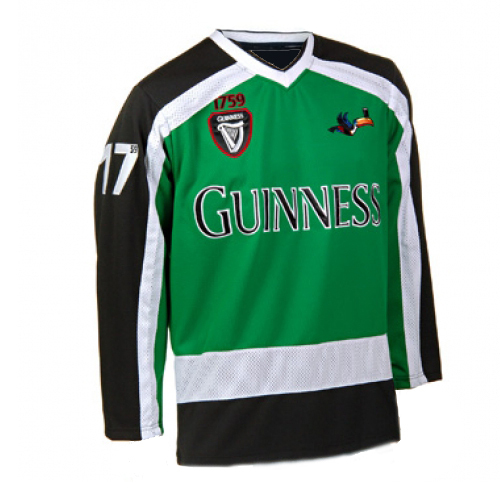 Here is your chance to own a real Guinness Beer Green Ice Hockey Jersey . Unlike many others this jersey is a authentic game jersey is superbly crafted and custom made, using only the finest materials. These Jerseys two-way stretch fabric, the Guinness Harp, name, and the Trademark Toucans and number 59 on the back with 17 within it and17 with 59 within it on both sleeves again tackle twill and embroidered. On the back again in tackle twill is 59 with 17, and embroidered guinness signature, this is the finest quality jersey you can buy. Jerseys are designed for those seeking the same high quality workmanship, as worn by NHL players. Unlike many of the our competitors jerseys, we never use screen printing or iron ons. We offer authentic quality design jerseys the price other charge for cheaper silk screened gear. Why pay two or three times the price only to get less? Why pay others $250 dollars for a jersey that is not as good ? Authentic style premium quality NHL jersey All STITCHED / EMBROIDERED, never screen printing or iron ons. All Jerseys are custom made to order and offered in a wide range of sizes for the whole family, we will be happy to make these jerseys in Mens sizes, Big & Tall Sizes, Ladies Sizes, or Youth Child Sizes. Jerseys for everyone, our mens standard sizes run from Extra Extra Small Size 34 to 10X (Size 84). If it is not a standard size, give us the measurements and we will do it. Through Siam Trading Post anyone you can own their own jerseys in any size. We are please to offer jerseys that are superbly crafted and custom made. Looking for another name & number, retired player, classic jersey, Throwback, or your own name and number? Because we deal directly with the suppler we can provide you with whatever you require, at great low direct pricing. If you don't see it just email us and we will make it. Authentic style premium quality NHL game jersey All STITCHED / EMBROIDERED, no screen printing or iron ons. Select the Size, and Shipping option you would like. This jersey will be shipped with the Embroidered Guinness Signature and 59 on the back. But if you would like a different name number just let us know in the checkout notes. Please allow seven days for production of this jersey. Ships Worldwide From our Philippines Office please select from the three shipping option. Contact for details or with questions.